Every 40-man roster player has appeared in a game for the Dodgers this season. The Dodgers have boasted about their roster depth all season. Now, one statistic neatly sums up just how often they’ve needed it. The Dodgers are one of two teams without a current 40-man roster player who hasn’t seen action in a major league game this season. The New York Mets are the other. It’s not unusual for teams to exhaust their 40-man rosters in September, when active rosters expand from 25 to 40. To do so in mid-August is rare; the Dodgers achieved the feat when Rich Hill made his debut on Aug. 24. Hat tip to Jason Martinez, found/director of content for rosterresource.com, for doing the research on this. Game 50: Citi Field is Chase Utley’s World and the 1986 Mets are merely visiting. NEW YORK — Chase Utley owned the Mets so bad on Saturday, a day the franchise set aside to honor its 1986 championship team, it became a part of his Wikipedia page. Utley hit two home runs, including a grand slam, and effectively got Noah Syndergaard thrown out of the game when a pitch whizzed behind him in the third inning of the Dodgers’ 9-1 win. The box score is here. Julio Urias‘ first major league call-up did not last long. Trayce Thompson removed from game after five innings with lower back soreness. NEW YORK — Trayce Thompson was removed during the fifth inning of the Dodgers’ game against the Mets on Saturday with lower back soreness. Thompson pursued a foul ball near the right-field wall in the bottom of the fourth inning, went into a slide, and might have been injured on the play. He did not catch the ball. Yasiel Puig replaced him in the field in the bottom of the fifth inning. 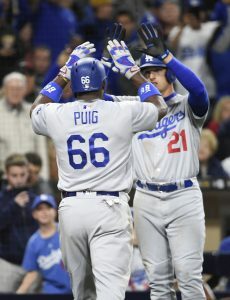 Puig had been given a day off by manager Dave Roberts and was scheduled to return to the starting lineup tomorrow. Thompson, 25, went 0-for-2 at the plate. He leads the Dodgers in home runs (6), RBIs (14) and slugging percentage (.655) in the month of May. 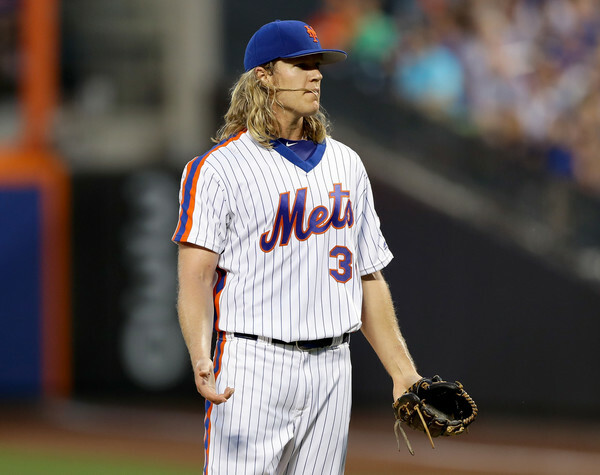 Watch: Noah Syndergaard throws a pitch behind Chase Utley, is ejected. NEW YORK — In the third inning of the sixth game between the New York Mets and the Dodgers this season, Mets pitcher Noah Syndergaard was ejected for throwing a pitch behind the back of Dodgers second baseman Chase Utley. New York Mets deny Dodgers’ request to use markers to position their outfielders. NEW YORK — Weird story today at Citi Field. It involves lasers and that’s probably the most interesting part. The Dodgers, after using the laser rangefinder, wanted to use markers on the playing surface to define the desired positions for their outfielders, and informed the Mets’ grounds crew of their plans. Initially, the Mets grounds crew agreed that the Dodgers could leave two marks in center field and one in left. … The Mets’ grounds crew, however, told their superiors that the Dodgers informed them that if the markers were removed, Dodgers players would dig holes in the outfield with their cleats. The Mets then instructed their grounds crew to erase or obliterate anything they saw on the playing surface. The Mets even reported what the Dodgers were doing to Major League baseball, a fact that surprised manager Dave Roberts since Roberts said “everyone’s doing it” — using lasers and markers to help position their outfielders.